When you search for games with a holiday theme, there is no shortage. You can easily fill a Halloween game night with the likes of Zombicide, Last Night on Earth or Arkham Horror. And there’s no problem finding a Christmas-themed card game. Even Easter has a lot of game representation on Amazon. But what about the holiday on the calendar for tomorrow – Valentine’s Day?! Oh sure, there are plenty of adult-oriented games one can purchase, but those obviously aren’t meant for game night. 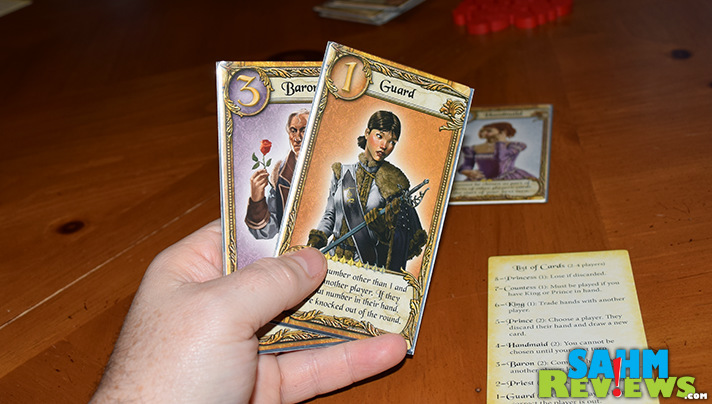 One family-friendly game we were introduced to a couple years ago is Love Letter by Alderac Entertainment Group (AEG). We enjoyed it so much that when a Batman-themed version came out last year and began getting rave reviews, we purchased a copy for ourselves. It got a LOT of play. Now there’s a Premium Version of the original Love Letter that is prestigious enough to be given as a gift to a loved one who loves all things games! Maybe you’re already familiar with the premise behind Love Letter. 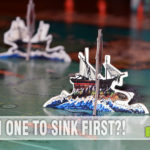 A brief refresher – it’s a game for 2-8 players and each round lasts only a few minutes. Depending on the number of players, you’re using either a 16- or 32-card deck, each player being dealt just one card. On your turn you simply draw another card and pick between the two of which to discard. When you do so, it activates the text on the card and may cause events ranging from forcing another player to discard their hand, looking at someone else’s hand or even knocking someone out of the round by guessing the number of the card they hold! Ultimately you’re trying to be the last person standing (or the player with the highest number card in their hand) when the draw deck runs out. The round winner is considered to have won the heart of the Princess and she awards them with a red wooden heart token as appreciation. 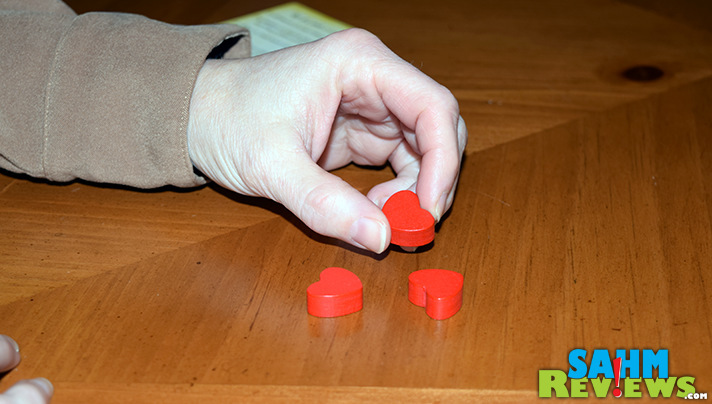 Additional rounds are played until one person obtains the required number of hearts to be declared the winner (varies with number of players). So why should you spring for this Premium Edition over a standard one? 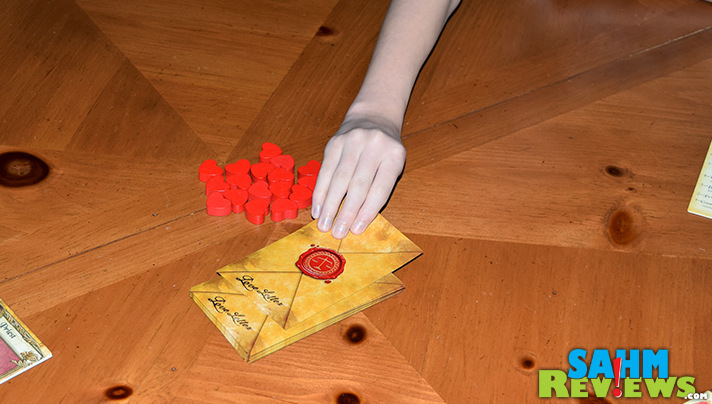 In the basic version you’ll get a deck of standard-sized cards, wooden cubes and a velvet bag to carry the game in. 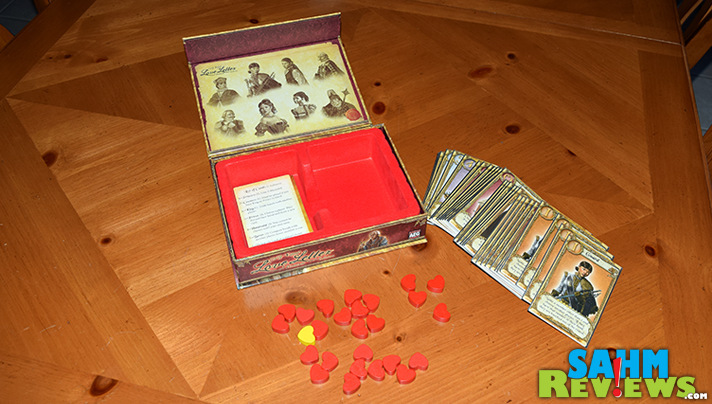 The Premium Edition features thick tarot-sized cards (MUCH easier to read), large wooden hearts instead of cubes and a simulated velvet insert tray to hold the game. 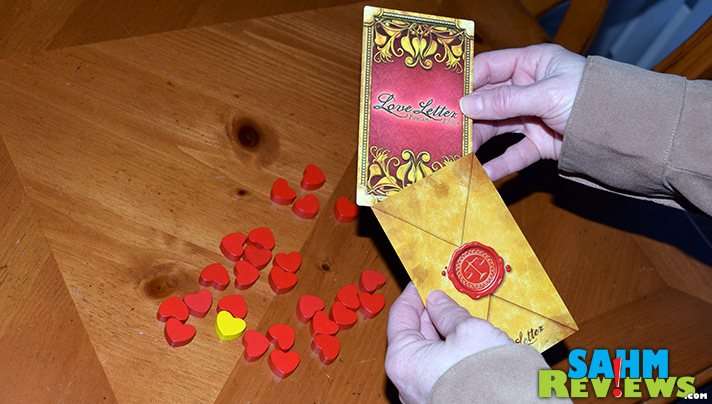 But even better are the custom card sleeves designed to perfectly fit the tarot cards, ensuring your copy of Love Letter will outlast any relationship! 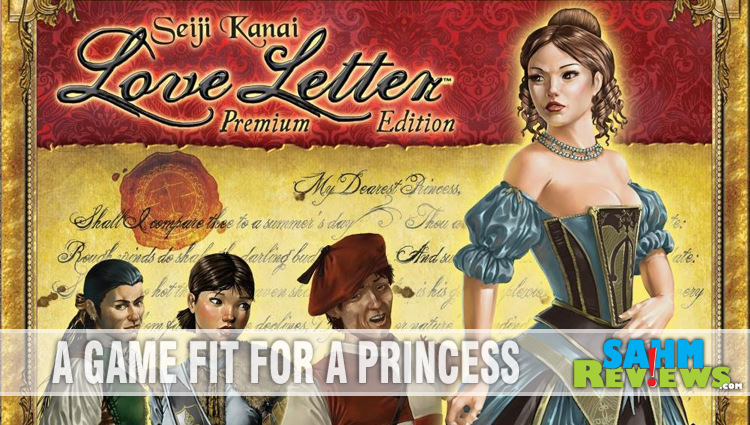 You’ll find the Premium Edition of Love Letter on Amazon for under $30, and the regular version for around $10. If these (or the Batman version) aren’t your style, there are other great themes to consider. Adventure Time, The Hobbit, Archer and Legend of the Five Rings have already been published and I’m sure there are more in the works! Be sure to watch AEG’s Facebook and Twitter feeds to know which ones are next! 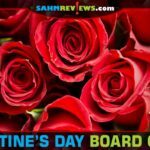 Do you have a favorite Valentine’s Day themed board or card game? This looks like a fun Valentine’s Day game! 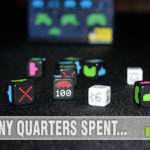 I never thought of having a game night on this day, great idea with this game! What does that little golden heart do? The golden heart is used when there are more than four players and the entire deck is used. This brings in additional characters, including the Jester. When you play a Jester, pick another player and hand them the Jester Token (the gold heart). If they were to win the round, you would also get a regular token to be counted towards your total. I’m always amazed at unusual games that you find. I’m in the process of clearing out some games we no longer play, so it’s fun seeing all the new games you review. 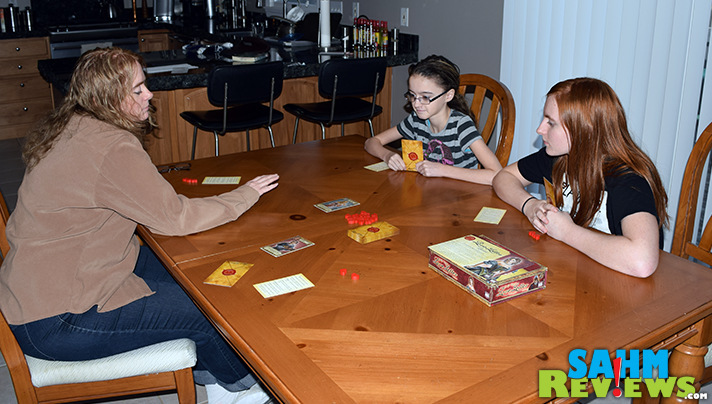 I never thought of doing a game’s night on Valentine’s Day, but it’s a great idea to incorporate the whole family in the holiday! I’ll have to check out this game. Oooo what a fun game!!!! I will have to write this one down and get it for the family. They will probably love to play this! This is a really clever and interesting concept. The rules on each card sound like they’d be fun and add a little bit of chance to the game. What a fun game. 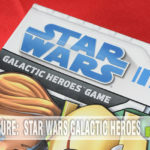 We are looking for some new and different games to add to our game library, this looks like it would be a lot of fun! What a cool game! I love finding new games and this one seems like a fun one to try. I actually think this is a game my 10 and 15 year old would both love! I love that it’s small on storage because we are running out of room in our game cupboard! Looks like an interesting new card game. I miss those days when we’d spend long summer afternoons playing card or board games with my kids. Now they are all grown up and have their own activities to attend to. I am waiting for my grandchildren to be old enough to play card games with me!